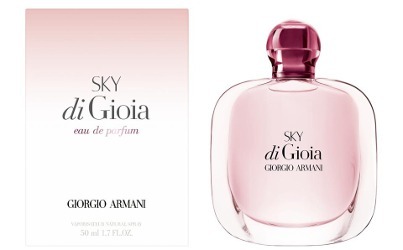 Giorgio Armani has launched Sky Di Gioia, a new fragrance for women. Sky Di Gioia is a followup to 2010′s Acqua Di Gioia, and 2016's Air Di Gioia and Sun Di Gioia. SKY di Gioia is a compelling experience transmitted by a vision of beauty and infinite scale that soothes and creates happiness... an image whose appeal never fades: the appeal of a sunrise that glows pink above the sea. It's also a message of hope: the start of every day brings with it an infinity of new possibilities, and every dawn is a promise of optimism. As round and smooth as a pebble, the SKY di Gioia bottle takes its inspiration from the very special palette of a Mediterranean sunrise: a very pale pink shading to light and reflected in the pure glass. The cap adopts a more intense shade of lychee pink. The notes feature lychee, rose and peony. Giorgio Armani Sky Di Gioia is available in 30, 50 and 100 ml Eau de Parfum.